This chart shows some examples of the forms in which New Zealand walnuts can be bought. This page is updated from time to time. Scroll Down for places to buy walnuts. 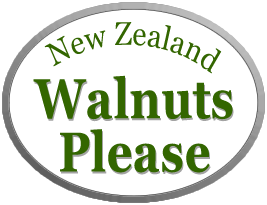 We intend to feature as many New Zealand walnut retail outlets as possible. Members who want to be listed (or want a retail outlet that they supply to be listed) should use the “Contact Us” page of this site to send in their details. New Zealand Walnut Group members who supply nuts are shown in green. Walnut Woodland, (June until stocks last). For pre-orders contact Nick Nelson Parker, phone 07 312 4639. 5 tasty varieties of in shell NZ Walnuts. Fendalton New World.19-23 Memorial Avenue. Fendalton, Christchurch. Fresh Choice Merivale. Merivale Mall, 189 Merivale Road, Merivale,Christchurch. NutZino Walnut Liqueur. Online www.NewZino.co.nz Also available from Franks Liquor at the corner of Ilam and Clyde Roads, Christchurch. Nelson Saturday Market, River Terrace Nurseries site, 8am till 1pm every Saturday.